Optoma is one-upping Oculus, HTC and Sony with its new wireless VR headset for PC gamers. 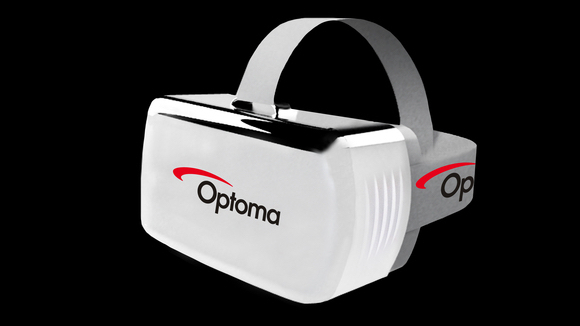 You've probably heard of Optoma from its projectors but now it's turning its attentions towards its new VR HMD which will be launched at some point in 2016. The headset will be compatible with OSVR, the open VR platform that includes partners like Razer, Ubisoft and Nvidia and, according to Optoma, features "near zero latency" though we'll believe that when we see it. The company hasn't gone into too much detail about how the headset connects to your PC, only to say it's a proprietary wireless signal on a 60GHz band. Optoma's VR headgear uses one 5.46-inch 1080p AMOLED display, so won't offer as many pixels as say an Oculus Rift, with a respectable 90 degree field of view. And just because it's wireless, doesn't mean the headset ditches head tracking - this is handled via a 2.4 GHz proprietary wireless signal, an integrated receiver and a USB connected transmitter. The bigger names in VR headsets have all chosen to stick to wired PC and console accessories for the first iterations, for quality's sake. But Sony has said it is interested in eventually making a wireless PlayStation VR and HTC and Valve, in particular, would benefit considering the number of devs who have taken advantage of the system's roomscale tracking. There's no price yet and Optoma says this is currently in testing so it could be the end of the year before we get an actual launch. We're reporting live from GDC 2016 in San Francisco so check back for first impressions of whether that zero lag claim stands up.